D. G. Associates was founded in 1988 on the principles of customization and personal service & established by Mr. Deepak Gadre. 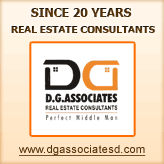 D. G. Associates has always been working differently from the other common real estate agents. We focus our attention on personally knowing our customers and understand their requirements- we feel it is important that we know who you are. D. G. Associates provides a professional service. Our employees work together by sharing knowledge and resources keeping in mind the customers’ specific requirements and provide custom made solutions. The result is that our customers are happy with the services that D. G. Associates provides. We take honor in the opportunity to be of service to our reputed customers and are grateful that our honesty, loyalty, understanding, accountability and creativity has helped in making D. G. Associates so different from the others. D.G. Associates has serviced Real Estate Requirements of customers across Maharashtra (India) for over 20 years. D. G. Associates realize that our relationship goes beyond the buying, selling or leasing of residential, commercial, corporate offices and industrial plots. • Properties for Sale Exclusive :- (a) 1, 2, 3, 4 Bhk Flats, Terrace, Penthouse / Bunglow available in Thane & Mumbai • For Company Lease (Mnc’s, Corporate & any other companies ) :- 1, 2,3,4 Bhk Flats, Terrace. Penthouse / Bunglow available in between Thane & Mumbai. (Furnished and Unfurnished) • Commercial Premises for Sale :- (a) Offices 1000 sq. ft to 50000 sq. ft and above (b) Thane, Mumbai & all over Maharashtra. • Commercial Premises on Lease :- (a) Offices 1000 sq. ft to 50000 sq. ft and above (Furnished & Unfurnished) (b) Thane, Mumbai & all over Maharashtra • Industrial Plots for Sale:- 1000 sq. mtrs. and above any where in Maharashtra. • Required Flats / Offices Bunglow / Plots for Sale / Co. Lease all over Maharashtra. • Distress Sale Flats also available. • Consultants : Property Matters, Liasoning Govt. Authorities, Investment Property Plans, Fix Income Property Plans.